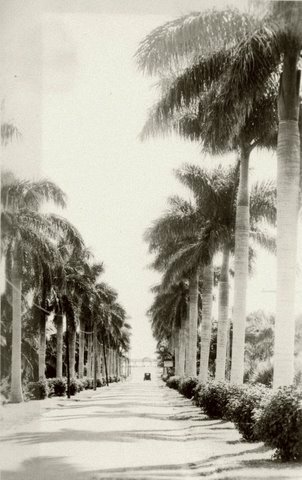 A Palm Tree lined driveway back in the early to mid 1900's located at possibly Hialeah Park Race Track in Hialeah, Florida. The Hialeah Park Race Track (also known as the Miami Jockey Club or Hialeah Race Track or Hialeah Park) is a historic site in Hialeah, Florida. Its site covers 40 square blocks of central-east side Hialeah from Palm Avenue east to East 4th Avenue, and from East 22nd Street on the south to East 32nd Street on the north. On March 5, 1979, it was added to the U.S. National Register of Historic Places. The Hialeah Park Race Track is one of the oldest existing recreational facilities in southern Florida. Originally opened in 1921 by the famous aviation pioneer Glenn Curtiss and his partner James Bright, in 1925 the Miami Jockey Club launched Hialeah's race track on January 25, 1925.